These waffles are what I imagine Christmas morning tastes like. Usually our family Christmas brunches are more of the dim sum variety, but if I ever were to branch out and have a cozy Christmas morning, just Mike and I, I’d love to spend a lazy time eating gingerbread cardamom waffles with vanilla buttermilk syrup and plenty of crispy bacon. It would be fitting too, because one year, for Christmas, Mike gifted me the waffle stick maker I used in this post. I have a thing for waffle makers – I own five of them, eep! I don’t know what it is, but I totally feel like a waffle’s shape affects a waffle’s taste. Sometimes I’m in the mood for thin and crispy, sometimes fat and fluffy and, in this, case, I felt like fun little waffle sticks. They’re soft, yet crisp and full of gingerbread flavour due to the molasses, cinnamon, ginger, nutmeg, and cloves. I added a touch of cardamom for a bit more holiday flair. All those classic spices always make me thing of Christmas. 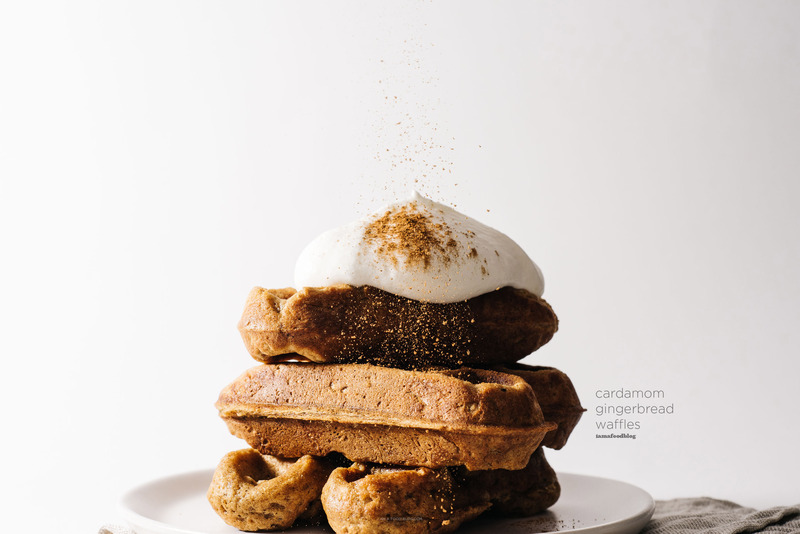 I’m a huge gingerbread fan and if you whip up these waffles your house will be smelling all cozy in no time, no chilling, rolling or baking needed! Happy Sunday – hope it’s gingerbread-filled! This post was sponsored by Simply Organic! Check out their Holiday Recipes for more ways to Spice the Season Right! In a bowl, mix together the flour, baking powder, baking soda, spices and a pinch of salt. 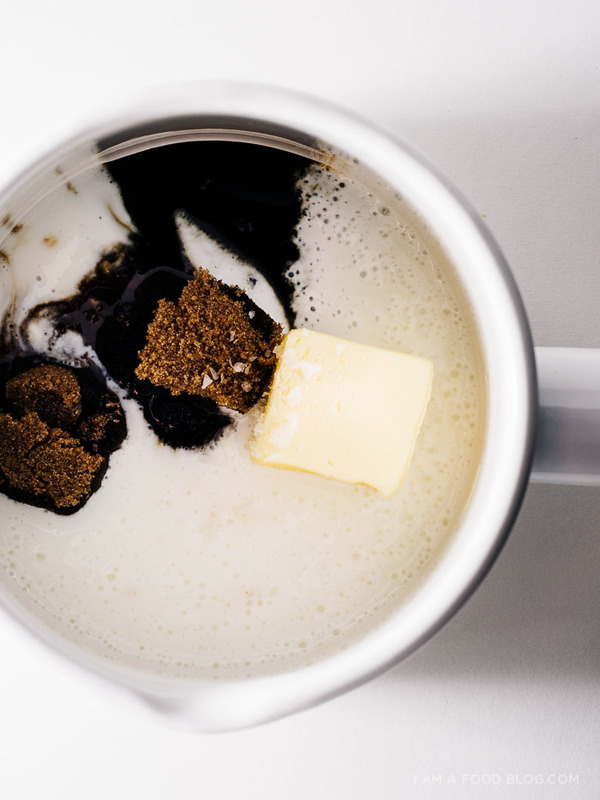 In liquid measuring cup, whisk together the melted butter, buttermilk, eggs and molasses. Add the wet ingredients to the dry, stirring until just combined. Let sit while you heat up your waffle iron. Grease your waffle iron if needed and cook waffles according to waffle iron instructions or until the waffles are golden brown and crispy. 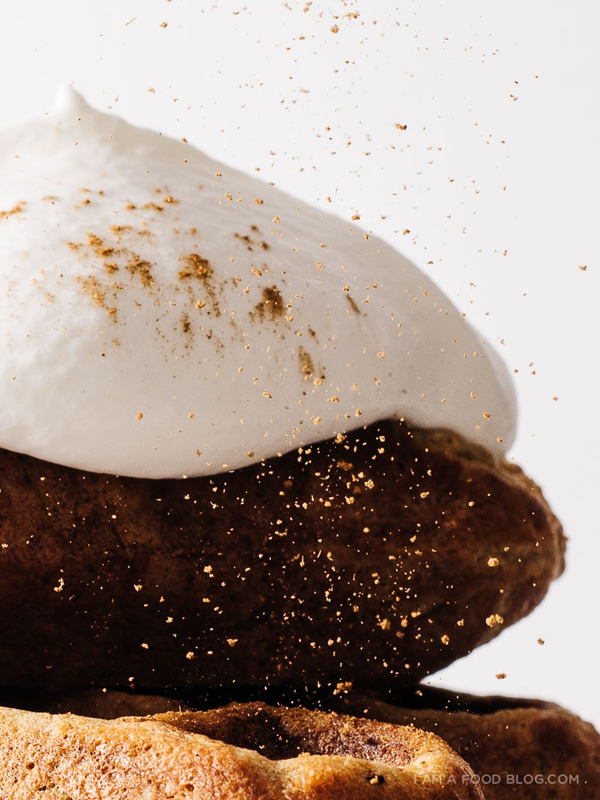 Top with whipped cream, a dusting of cinnamon and syrup. Enjoy hot! In a deep-sided pot, bring the first 5 ingredients to a gentle boil. Stir in baking soda – be careful, it will foam up. Boil for a minute, stirring occasionally and remove from heat. Stir in vanilla and spice and enjoy warm. Yep, these have got to be what Christmas tastes like!! Delicious! This looks fantastic – I love how it’s ‘snowing’ cinnamon! 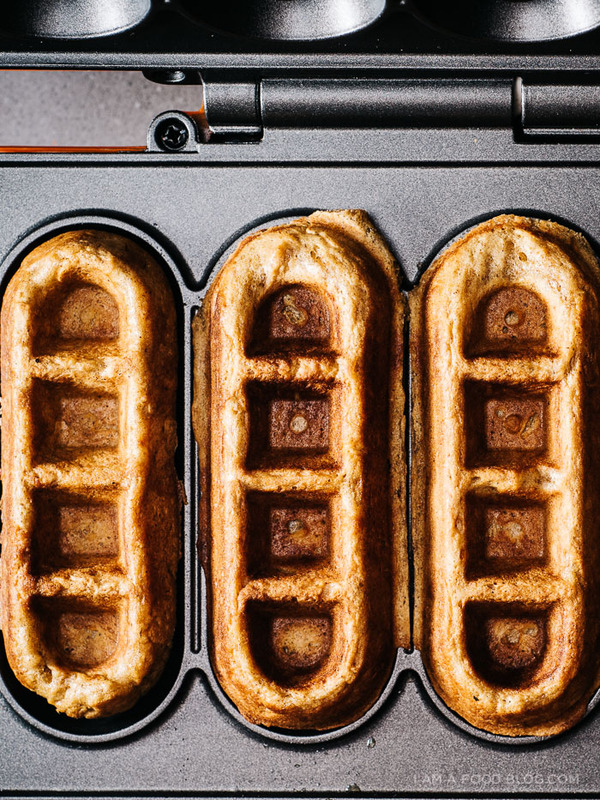 wait, hold the phone — does your waffle maker make WAFFLE STICKS?! what a cool waffle pan! and right on for christmas-flavoured batter. WAFFLE STICKS. This is the coolest thing ever. And the most delicious + Christmas-y + magical thing ever. I love this, Steph!!! aww thanks so much cynthia!! christmas is my most favourite EVER! I wish I had five waffle makes too! I totally agree that the shape/size/thickness make a difference in the overall experience. 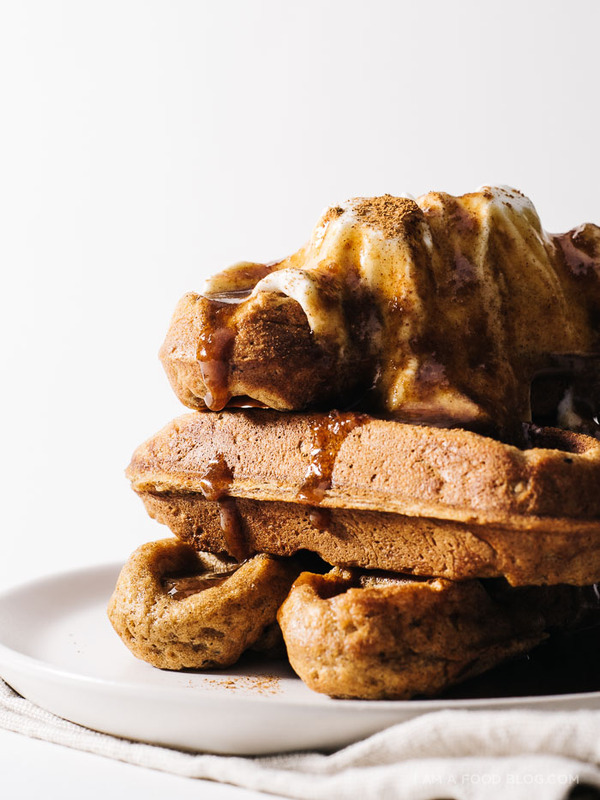 These waffles sound/look amazing! They are Christmas morning in waffle form. So awesome, Steph. Perfect for this time of year!! Looks delicious! Thanks for this! The last time I was here, you posted that recipe for those delicious Pumpkin Ricotta Pancakes. I love how you always have something for every season and holiday. Last time the pumpkin ricotta pancakes were just in time for the pumpkin season and this time these waffles sound perfect for December mornings. Couldn’t think of a better way to get into the Christmas spirit! I don’t know what it is about the gingerbread taste but I think by now my brain is programmed to associate it with the holidays so I’m always in a good mood whenever I get a whiff of those spices. Thanks! I just can’t stop with the cardamom this time of year. So good! 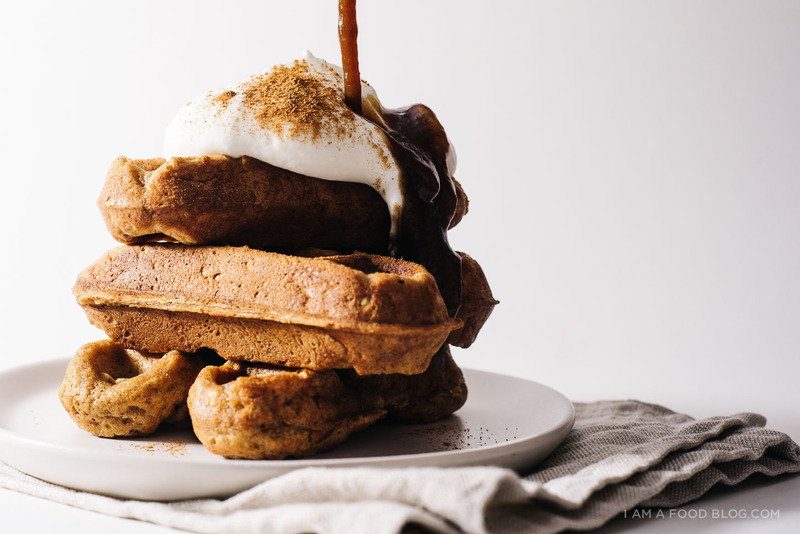 These waffles look like a total dream!! Beautiful, I’m making these soon! I only really discovered cardomon last year, and I LOVE IT. Gingerbread seems to be the flavor of the season for me too. PERFECT! Those waffles look so incredible! That shape! And the combination of gingerbread and cardamon must be so good and Christmas-y indeed! Now this looks good!love using cardamom in sweets. Makes excellent ice cream. Funny really because I only discovered using it inbsweets last year. Amazing thing about being a foodie is the constant learning. All the best, and a lovely blog. You’ve just inspired me to want to own a waffle machine! It’s going on my Christmas Wish List. Steph! I’m so glad I found your little corner of the web. It’s FAB! (I may or may not have just stalked your About page and omg *squee* let’s go get noodles sometime! Or dim sum brunch, I’m not picky really.) Your waffle pics give me the same warm feeling I get after watching a particularly good rom-com, except THESE I can achieve IRL, no problem. Thanks for sharing–I can’t wait to see more and more and more of what you come up with, girl! Awesome to “meet” you! I’m a bit nervous, the last time I went on this food blog I didn’t leave for about an hour. I then left the page drooling, wide eyed and frantically making lists of all the ingredients I need to buy to make all the delicious things on your blog – inviting people for dinner all over the place just for an excuse to cook wonderful things. These look fantastic! And waffles is what Christmas morning is like in our house, with lots of bacon, maple syrup and mimosas! I’ll bookmark this recipe, because I have not decided which ones I’ll be baking on the big day yet! Hi, can you post a list of the waffle makers you use? I don’t know which brand to invest on and yours always look DIVINE. What waffle iron is that? It looks amazing. Hey! Do you add the 2 tbs of molasses with the buttermilk / egg / butter? I think so… but just want to check? Thanks!